June 26, 2011 - ATR renewed and expanded its ISO 14001 certification, concerning businesses’ adherence to environmental standards. The broadening in scope of this certification enables ATR to become the first regional aircraft manufacturer to obtain ISO 14001 certification covering the entire lifecycle of the aircraft. The new ISO 14001 certificate was presented to ATR at the Paris Air Show by Eric Salaun, CEO of the certification company Det Norske Veritas Business Assurance France (DNV). The awarding of the certification took place in the presence of Mrs. Nathalie Kosciusko-Morizet, Minister of Ecology, Sustainable Development, Transport and Housing and of Mr. Thierry Mariani, Secretary of State for Transport. The renewal of the ISO 14001 certification involves respect for the environment, which holds true for ATR headquarters in Blagnac as well as for its production site in St. Martin-du-Touch, where assembly, customization, ground and in-flight tests, sales and customer support activities take place. This extension in scope attests to ATR’s respect for the environment and applies to all stages in a product's lifecycle: design, parts and equipment purchases, transportation of aircraft subassemblies, customization, painting, plane operation by airlines, technical and operational support, and specific customer support to the -500 and -600 series ATR aircraft. The renewal and expansion in scope of the ISO 14001 certification makes ATR a leader in the market for regional aircraft in line with sustainable aviation. Eric Salaun, Chief Executive Officer of DNV said: “Respect for the environment is also becoming a major responsibility in aviation”. All the players, both aircraft manufacturers and airlines, need to make every effort to reduce their impact on the environment. Filippo Bagnato, Chief Executive Officer of ATR, said: “We are delighted that ATR's respect for the environment, which started from the very beginning -just over 30 years ago, is being recognized by this certification. Today our aircraft are the most environmentally-friendly planes in their class, with CO2 emissions just half those of regional jets and with the lowest noise emissions out of respect of those who live in close proximity to airports. “We carefully ensure that the environmental advantages of our aircraft are also associated with respect and protection of the environment at our sites, whether at headquarters or on the final assembly line, or through our operators and our worldwide support network. We are proud to be the reference for environmental friendliness in regional aviation”. DNV Business Assurance is one of the first certification companies in the world. By proposing services of evaluation, certification and training, it gets close to its clients to enhance the performance of their products, of their procedures and of their organization. 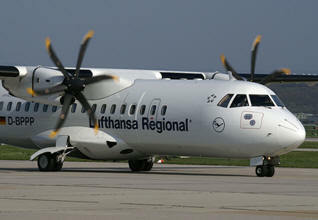 ATR has become the world leader on the market for 50 to 74 seat turboprop aircraft. From the beginning of the program, ATR has sold over 1,100 planes, which are used by 175 operators in over 90 countries. Their planes have totaled over 21 million flights. ATR is a fifty-fifty partnership between two major European aeronautics players, Alenia Aeronautica (a Finmeccanica company) and EADS. ATR headquarters is located in Toulouse and ATR is ISO 14001 certified, the international reference standard in the field for environmental friendliness.